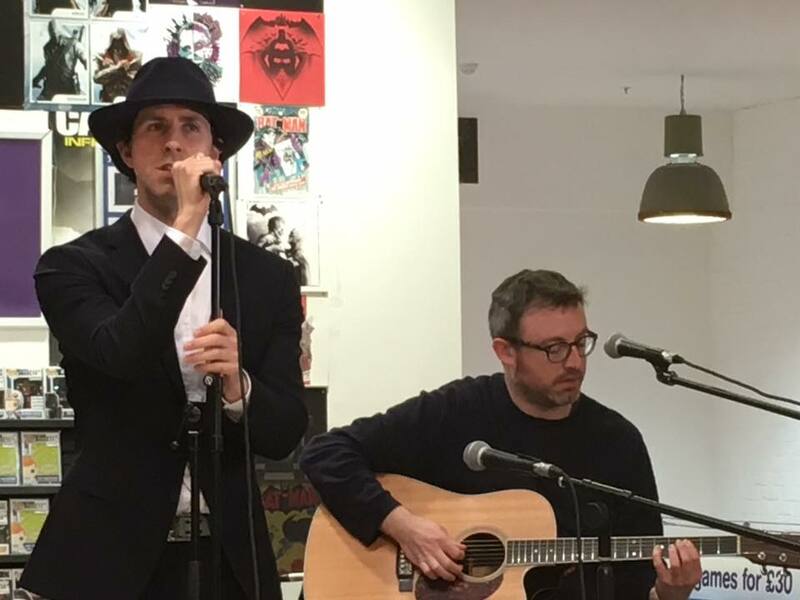 Maximo Park are launching their latest album Risk To Exist with a series of intimate in-store performances. We caught their Sunday afternoon visit to Manchester's HMV to find out a little more about the record and hear five acoustic songs, three from the new album and two from Our Earthly Pleasures. As with many of these in-stores, Maximo Park appear in stripped-down form, just Paul and Duncan on an acoustic guitar appear in front of a crowd that's stuffed in between the aisles of Ed Sheeran and other assorted CDs on the upstairs floor. They're here to promote new album Risk To Exist, but Paul promises that they'll also play some older material to keep the punters interested. It's a piece of self-deprecation that doesn't do justice to the new record. Like so many bands of their age, the past often hamstrings Maximo Park. New material isn't often given the space to breathe and grow amidst the growing swing towards heritage, and in their case their debut album A Certain Trigger and its follow-up Our Earthly Pleasures. Yet in Risk To Exist they've written an album that can stand tall against those and anything they've done since, a record that channels Paul's frustration and anger at the decay of the political and social fabric of the country. The songs from that record translate well to the acoustic form despite his protestations. Risk To Exist, What Did We Do To You To Deserve This? and Get High (No, I Don't) are articulate passionate songs and you can see Paul almost seethe as he delivers them. Fans mouth along to them like they're old favourites even though the album has only been out 48 hours. What Did We Do was recorded within forty minutes of them arriving in their Chicago studio and has undergone a significant reinvention to get to this format, but it works whilst Paul introduces Get High as a song that mean whatever you want it to, a kickback against coercion or insidious right wing talk. During it, Paul leaves the makeshift stage and comes right up to us, to questioning glances from the in-house security. It's his response to the intimate format of the show curtailing his exuberant full-on stage performance which has made them one of the most consistently exciting live bands around. He's also on engaging form throughout, joking that he's dreamt of playing to the sound of Ed Sheeran CDs smashing to the ground when someone moves and displaces some from the racks, telling us the stories behind the songs and describing the new album as "minimal political punk pop with an aggressive tinge." There's time to look back too - Nosebleed (a song about a dream set in Manchester, Paul tells us) and Nightfalls from the ten-year old Earthly Pleasures also get an airing, a reminder to how much they've delivered in their existence. But it's the new material that really steals the show; another example of older bands delivering work of substance later in their careers against the odds and the tide of the music industry's love of looking back rather than forwards. Maximo Park's official site can be found here and they are on Facebook and Twitter.